Hardbound: 240mm x 159mm - 580 pages containing 222 photographs; RRP $40nz, $32us, $21ca, 13#uk. Paperbound: $40au - 234mm x 155mm - 858 pages (length unconfirmed). 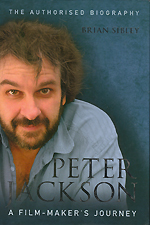 This is the promised Peter Jackson authorized biography, contrasted to the unauthorized biography by Ian Pryor that was released a couple of years ago (see its info below). Therefore do not expect any exciting exposes or behind the scenes dirt. You will, however, receive a great deal of background on 'Bad Taste', 'Lord of the Rings' and 'King Kong', with plenty of background on all his other projects. There are also some 223 photographs to add clarity and a useful index. Unfortunately, there is no bibliography or filmography. For those features, you need to look to the Ian Pryor book. If you are looking for as much detail as possible about Jackson and his history to date, I would suggest that you need to read both books, but if you only have time for one, this would be your best single source as the author not only can draw from his previous material that he collected for his Lord of the Rings books, but he had access to dozens of Peter Jackson's colleagues in addition to actors and crew members that have been a part of the adventure that has developed over the past two decades. Worth the wait for Peter Jackson fans and students of film-making. - xi - Prologue: Where is Peter Jackson?